Who’s Your Master of the Universe? Is it not ludicrous to ascribe some attributes of mythological deities or laughably the cartoon/movie characters, to business and financial moguls not giving them more credit then they deserve. Is it not the demand of the masses for ‘Free this or that’ that gives rise to the power of these intrepid entrepreneurs? Could it be that the Toffler statement – “Information overload will lead to ‘future shock syndrome’ as an individual will suffer severe physical and mental disturbances.” – be more than a syndrome but now an addiction? Every time I hear or read in the media that the ‘Masters of the Universe’ are doing this or that, my imagination can envision these moguls of technology and finance playing the games of the Olympian gods on “Jason and the Argonauts” as they search for the Golden Fleece. So our modern story can take the lessons of mythology as a metaphor for the actions of global business oligarchs or it can twist to the social political shift of the masses wanting something for nothing. Wait, isn’t there another statement to the effect that “There is no free lunch”? The extensibility of that questions rips to the heart of every individual that assumes that the Internet and the content is free! The reality is that every application on the Internet, every system made available to the public is in fact the property of a company. So is an individual’s expectations froth with misguided ideology in that using the likes of a search engine, browser of social media software should be free? Has the “entity in the Matrix pod” developed such a dependency and expectation of their being plugged in to the environment such that all is given freely – while not knowing the tentacles that hold every aspect of their persona for the use and pleasure of the ‘masters’? Isn’t this digital socialism? Here is the hard fact, that is not thought through because of all of the emotionalism manipulated by those other high seated Olympians in the political temples: Social media and all that lives on the Internet absolutely are ‘For Profit’ Businesses (period)! Hence there is NO FREE LUNCH. Yet the digital ideology of socialism is widely accepted even by so called ‘conservatives’. How did it happen that even so called Conservatives find themselves in the battle with the Marxists and all in-between to retain the addiction of socialism in social media when otherwise they cry with great tears that free markets must prevail? Are we seeing a conundrum of “Selective Socialism”? 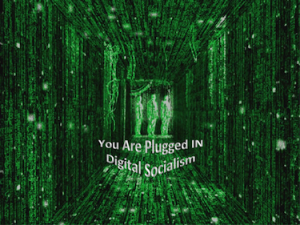 It is fine and dandy to get all the technology free-bees over the Internet one can run away with but other than that socialism is not acceptable in our Constitutional Republic – Hmmm! I have to take U.S. all back to Toffler once again. I know there are many who have no idea who Toffler is. Let it be noted that he was Futurist and a Marxist that somehow redeemed himself into a neo-free market Gingrich Conservative… And Gingrich claimed to be “conservative futurist”. No matter how you look at them, the operative clause in Webster’s Dictionary for ‘futurism’ is: “impose controls”. In the case of Gingrich, he had been a friend with both the Toffler’s since 1970, which allowed for the incorporation of this influence into the “Contract With America”. Yes, before the Olympians in Silicon Valley there were the Futurists in ‘The Swamp’ of DC who in so subtlety determined that Toffler’s ‘Third Wave’ was “the seminal work of our time”. A simple step toward a conclusion here is that leading Republicans and Newt were immersed in the means of blending socialism into the Republic through technology, education and cultural change. They were and are the intellectual elites that Thomas Sowell writes about. Accepting socialism in social media, demanding that ‘Free Lunch’ from private profit-driven companies, Conservative lobbyist groups and political groups crying foul when they are sent to the bottom of the time-line feed or thrown off any particular site – What asininities to clamor for equality by businesses that are takers, purchasers of ones identity in exchange for the perception of a right to free speech on systems and software that are as was stated, Private Property of the creators – the Olympians of Silly-cone Valley. Let me try to bring the analogy of the allegory concerning the comics of “the Masters of the Universe” and “Olympian gods” in the context of the vast majority addicted to socialism via social media. Long before the triad of the Toffler’s and Gingrich there have been those that look to dominate society by excreting their self-assumed superiority as reminiscent of Caesar, Nebuchadnezzar or the technologist Sennacherib of those really ancient days. But then again, we don’t teach ancient history let alone back to the futurists of the ‘70’s. All of these influencers of intelligentsia had an effect in what the general society would believe even in the political strains of Conservatism. I can easily conclude that the greater numbers of these Olympian idealists of societal influence and business magnates see themselves as ‘masters of the universe’ forgetting that in fact they are created beings subject to “The Master of All the Universe”. The ultimate question becomes what master and what society do individuals subscribe to? That does not mean what social media application does one login to but what is ones ultimate worldview that establishes expectation that one deserves, no, has a right to something for nothing yet willing to give every aspect of their persona away to private businesses capitalizing on the essence of their being? In the end of all my technological and business background, with all that I’ve studied and worked for in the social and political environments – The conclusion is “There Ain’t a Free Lunch in this world”. But I do know that there is a Freedom that supersedes technology, the moguls and the Olympians of Silly-cone Valley. I found and live by that freedom found in the great communications environment – The Bible. Who is Your Master and how do you justify your addiction to socialism instituted in social media? In the end, If you really believe that you want your privacy and you desire to maintain your Liberty with a right of Free expression on a communications platform, whether it be a news paper add, telephone call, post card, bill board or other media methods – Well, you have to Pay for it! With that in mind, there are alternatives that are out there, which are becoming that mass communications platform that you want. So, you will have to choose: subscribing to a communications platform that meets your worldview or sticking with socialism by not paying with money, instead paying with your identity and persona to corporate platforms that have the mask of Medusa hiding their glaring nefarious ideologies and intent? Tom Niewulis is a former telecommunications and data-Internet executive. He is a serial entrepreneur, political activist, blogger and author of two Constitutional reference books.